Use < and > to change between the front and back of the map. Use + to zoom in. For touch screen devices, use your fingers to zoom. The Pattaya Guide October 2018 is now available and consists of three guides printed every month, they are the Magazine, Eating Out, and the City Map. A total of 15,000 copies are printed, that’s 5000 copies of each guide. 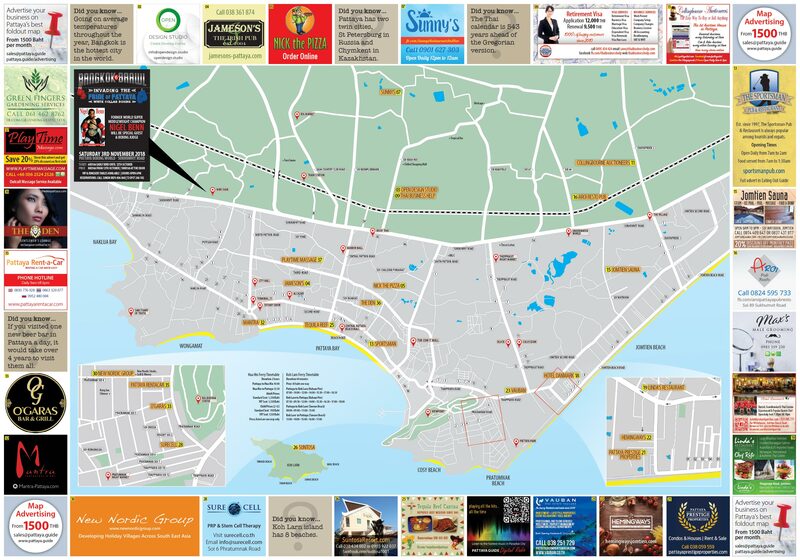 We print more than any other local publication, which leads to greater reach of tourists and expats. They are distributed to over 500 prime locations in and around Pattaya, and also distributed with every food order with Door 2 Door, FoodPanda, and Nick The Pizza, the biggest food delivery services in Pattaya. The Pattaya Guide is free for you to pick up, put in your pocket and roam. Pattaya Guide Magazine comes packed with multiple sections from getting around to activities, attractions, health, fitness and so much more. Plus the nightlife guide featuring bars, clubs, pool halls and live music venues. 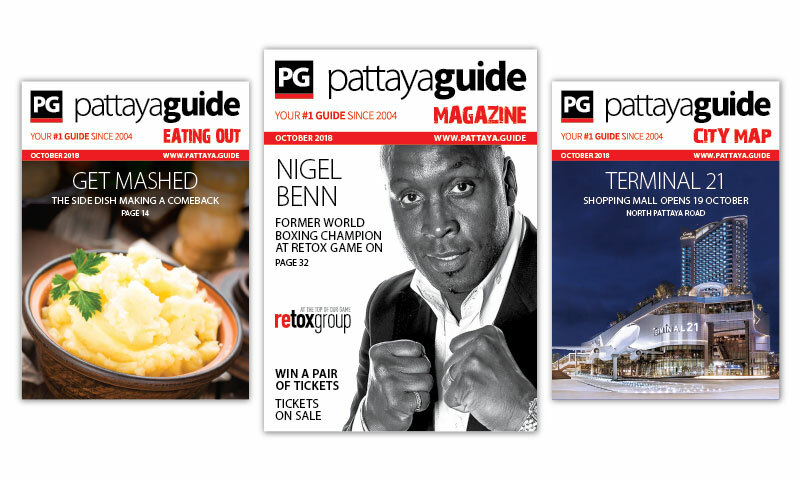 Pattaya Guide Eating Out features the best places to eat out in town, features expat groceries, restaurant review, under the hood interview plus the international dining guide, pub & bar dining guide, fast food & delivery guide. 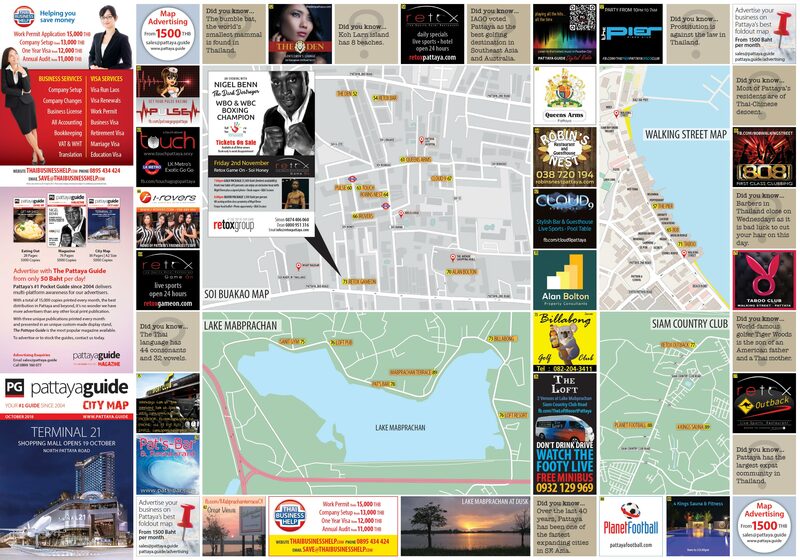 Pattaya Guide City Map is a monthly foldout tourist map featuring over 50 places, and it’s the largest free map available. The Pattaya Guide October 2018 is free thanks to our advertisers, please support them.